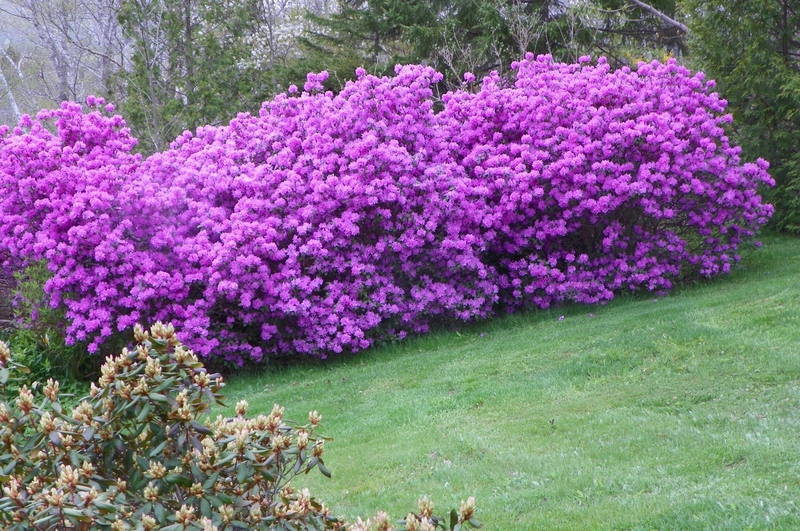 In the photo: a hedge of purple flowering rhododendron. Hedges are bulky and massive, require a lot of space. Free growing culture can be in such plantings monovinyl and combined, single-row and dual row, are easy to care. Plants create a lush and colorful background, which protects from the prying eyes and turns the plot in a real fairytale Kingdom. Resistant, hardy fence, does not require constant haircuts, fill the garden flavors and colors, can distract from the bustle of everyday life, to fill your life with happy moments of relaxation and pleasure. Before, than choose the culture for such free landings, you need them to explore. Bush universal and unpretentious, fresh and large foliage creates a dense curtain. The aroma of lilac blossoms attracts people and insects. Culture before shed leaves in autumn, this lack kompensiruet luxury of spring and the natural dimensions of the screen. The plant produces numerous shoots, you can use, as the seedlings. A huge white-pink-purple brushes look good both in mixed, and multi-row hedges. 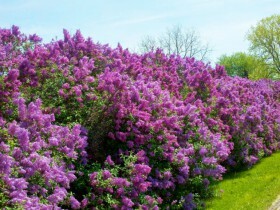 Lilac – shrub hardy, hardy and easy to care for. It does not demand additional frequent watering, it can be subjected to pruning. Culture adapts well to different climates and soil types, rarely sick and affected by pests. The best conditions – loose, quality, slightly alkaline or neutral soil. Hungarian, hairy and common lilac. It is best to choose released varieties, proven and has become a classic in the region. Familiar and accessible types for hedges, preferable rare and the variety of forms, which would be better to look in the specimen and group plantings, ornamental. It is desirable to select varieties not elongated, a rounded shape. Live lilac hedge can be laid in late autumn and early spring period, before, as the shoots appear first buds. Planting – containerized seedlings or young delenki with exposed roots. The best option: seedlings two to three years, shoots with two or three buds, shortened roots. Fences the standard height of two to three meters planting of plants at a distance of six feet between the bushes. Small species of lilac are fitted at a distance from 30 cm to meters, high – up to 2 m. Dimensions of planting holes – two feet in depth, the length and width, mandatory drainage layer. In the soil mixed compost, any other organic, wood ash, a complete fertilizer. After planting each Bush, abundantly watered, soil mulching with peat or humus. Lilac watered weekly until the beginning of regrowth, such a schedule retain until the desired height of the fence. The first two or three years after planting of landscape fence is not fed and cut. Fertilizing starts in the fourth year, full of mineral and organic fertilizers are applied in early spring, alternating between those and other. Regular watering for such a fence is not needed, pruning practically not possible. To thicken the grown bushes, they leave up to ten strong shoots, to improve flowering in the fourth year, the annual thinning. It is desirable to remove obsolete stalks and side shoots. 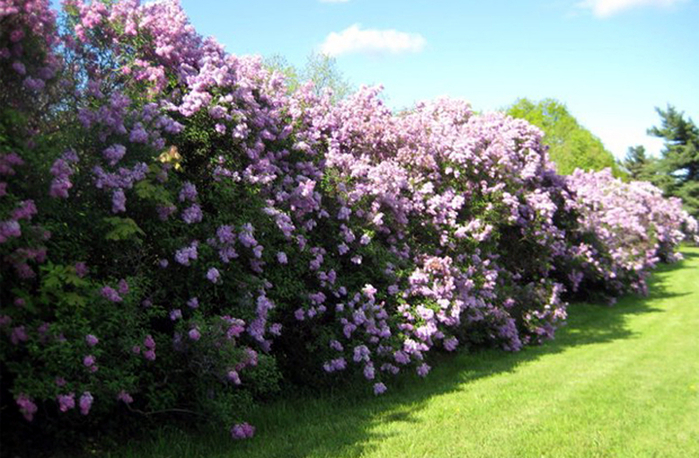 Lilac tolerates severe pruning and, if the lower part of the bushes running up and stripped, culture can be radically rejuvenate, cut all the planting to a height 10 – 15 cm from the soil surface. Hats inflorescences on a wide, dense and beautiful Bush – the decoration of any garden. Ovate leaves form a showy crown of up to three meters in height, which is decorated with hats and corymbose paniculate inflorescences light green, white, blue or pink color. Hydrangeas come on the garden scene in mid-may. Unlike most types of shrubs, used for hedges, culture blooms towards autumn and adorns the site until October. Dry buds even in the winter look very good. 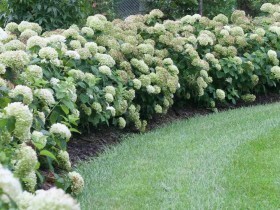 Of hydrangeas are very elegant hedges, medium and low. Culture in multi-row hedges can be perfectly compatible with rhododendrons and ephedra, who are planted in the background. In the middle lane hydrangeas require bright lighting, under mild conditions, prefer shade and partial shade. Shrub picky about the quality and composition of the soil, the best soil is slightly acidic and acidic soil, neutral soils, fertile, loam, quality on the structure, waterproof. large and beautiful inflorescence and leaves. For creating free, deformirovannykh hedges use two kinds of hydrangea: paniculate and tree. Varieties can be tall and compact, crown dense and rounded. The difference between these plants in the form of inflorescences: have tree hydrangeas they are corymbose, at panicle – elongated. The fence is a screen of the create a hydrangea in early spring. Paniculata varieties planted in a permanent place at the age of four to five years, the tree can be younger. Before carrying out planting work at saplings shorten long roots and shoots to three or four buds. The distance between the bushes about one meter. Planting of hedges carried out in the trench, at the bottom lay a drainage layer, in excavated soil adds humus and peat. The root collar should remain on the soil level. Hedge abundantly watered, the soil mulch layer of peat. 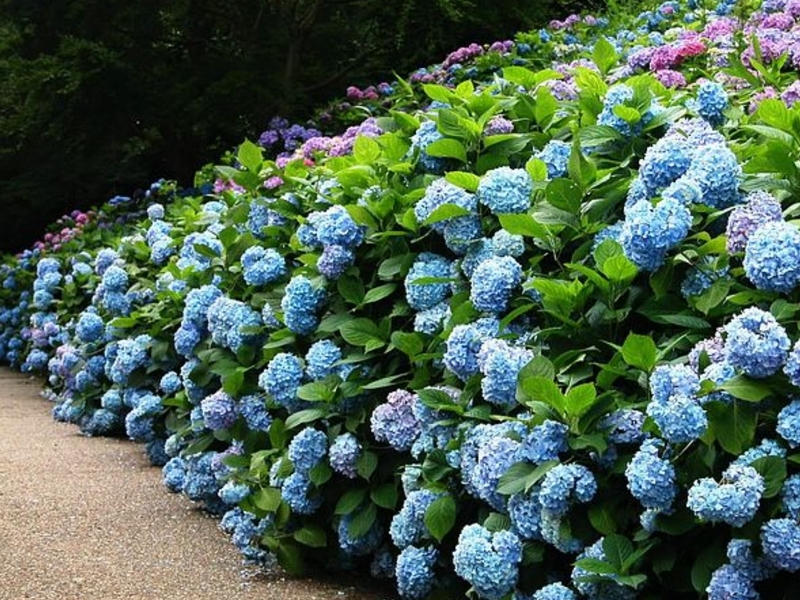 Hydrangeas need fertilizing, they spend the first year after planting. Nitrogen fertilizers are applied in early spring, during budding introduce a complete mineral mixture, twice during the summer, pour potassium-phosphate complex or mixture. Shrub hygrophilous, needs regular watering. Even if the weather is regular rainfall, once a month, conduct a deep watering of the entire fence, during a drought do it more often. Throughout the season the soil surface is loosened, weeds are removed, maintain a layer of mulch. After planting the hedge in the first two or three years, the hydrangea Spud in winter to protect from frost. Landing need pruning. Tree and paniculata hydrangeas bloom on the branches of the current season and without cropping they are poorly developed and can degenerate. In the first year after planting, shorten all the branches half to two-thirds the length. Large bushes need a stronger pruning. The following year, removed last year's growth to the first, well-developed, kidney. Work is conducted in March or April, during Bud swelling. Every two to three years is thinning, removed old, lignified shoots. Old hedges can be rejuvenated by pruning to a height of 80 cm. In the autumn the faded blossoms are removed or left to decorate the winter landscape. In the photo: a hedge of forsythia. Bright flowering shrub is famous for the early blooming time and the dazzling yellow colored flowers. Forsythia is better than many other shrubs adapted to harsh winters, creates a bright spot in the garden landscape at the beginning of the season. The flowers appear before the leaves, they bloom on bare branches. Culture does not lose the attractiveness to the end of autumn, later, the plant is decorated with a crown of bright green color, changing beautiful autumn outfit. 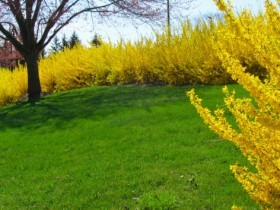 Forsythia is planted in single-row and complicated fences, combines well with later blooming shrubs. Preferred Sunny or partial shade area, the plant does not like wind and drafts. For a good development requires neutral or lime soil, drained, easy, nutritional. the striking appearance, continuing all season, fall colors, beautiful background quality. To create hedges are used species and varieties with high winter hardiness and foliage. Have these qualities forsythia intermediate and ovate. Varieties, not forming a dense crown, you can use the subject combination planting with other crops or mixed planting of multi-row. It is better to buy released varieties. The forsythia is better to plant in autumn, in late September and early October. The distance between the plants – 1 m. Planting holes – individual, standard, depth – 70 cm. At the bottom lay a drainage layer of sand, crushed stone, brick. Excavated soil mixed with a complete mineral and organic fertilizers. After carrying out the planting work of the plant is mulched with dry leaves. Planting forsythia is carried out on the eve of autumn frosts, shoots bends gently to the ground and fixed with pins. In the first year of planting need to be covered with fir branches or any artificial material, breathable, not threatening to podpisania. Spring cover shoot, better to do it as early as possible. Fertilizer under the forsythia make a few times a year. The first feeding is early in the season, in the form of mulching with humus, the next two – before and after the beginning of flowering, accordingly, a complete mineral and potassium-phosphorus fertilizer. Culture does not need watering, the exception is a prolonged drought, during which hydration is necessary for the laying of flower buds for the next season. After heavy rains spend loosening the upper soil layer to a depth 30 cm, mulch update. Forsythia need an annual pruning. Young plants form as needed, removing the frosted-over ends of the shoots. When the hedge reaches the desired height, conduct selective pruning, removing distracting from the contours shoots. In June there is a mandatory cropping, branches are shortened to the first strong buds or well developed side shoots. Cut dry and old branches, above the soil leave low stumps. Every three to four years, the hedge rejuvenate, shortening the bushes at two-thirds height, stimulating the emergence of new, the young and strong, shoots. Without pruning forsythia quickly loses its beauty and attractiveness. Floriferous culture is completely devoid of the smell. The main competitor beautiful spirea reaches four meters in height. The shrub is very elegant, hedges of Dali look elegant and attractive in all season. The plant is not only an abundance of flowers, but also easy to maintain. Foliage – bright, forms a lush Bush with a curved hem and arc branches. Flowers are often rabid, in racemes, the greens beneath them almost invisible. Thick and romantic and attractive shrubs after flowering. Dacii used for forming hedges of medium height, to 2 m, they look good in mixed plantings. He is not capricious culture and sustainable, it tolerates air pollution. The hedge blooms profusely with enough light, tolerates any soil composition, but prefers the soil moist and loose, without excessive acidity. In Central compendium can freeze solid in the snow line, but it is quickly and completely restored and blooms. the speed of growth, recovery after freezing, minimal maintenance. Ideal for creating hedges are all hybrid varieties, allocated abundant flowering, the ability for a long time to protect the form without refresh, the rapid growth. The most spectacular hedges are obtained from hybrids dacii rough and elegant. 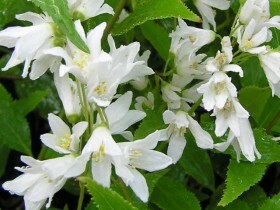 Look good by planting varieties "Lemoine" to 2 m in height, large panicles which appear in may-June. To create screens using the compendium of Amur or small -. Hedges of dacii better to lay in the spring. To create a fence often used plants, obtained by the method of grafting. The bushes are planted at a distance of five feet from each other. Planting holes – individual, depth – up to half a meter. At the bottom lay a sand or sand-shchebnevy drainage up to a height of 15 cm. Root collar of planting material to be above the soil level. After planting is abundant watering, mulching. Hedges dacii easy to care for, the plant needs virtually no dressing, but it is better still to hold in early spring, to Bush does not lose its beauty for decades. Paid a complete fertilizer or organic matter in the first half of the season. Water the planting to maintain a stable soil moisture, in dry months this can be done several times. Dejavue like loosening the soil, weeding, mulching with peat. In the landscape hedges trimmed culture, limited to removal of damaged and dead branches. Young trees in the first years of the little Spud before the onset of winter, the most tender instances of bends to the ground and covered. In subsequent years, in such pre-winter preparation plants do not require. In the photo: the hedge of briar. Regal plants are great in any incarnation, including hedges. For the roses, growing up in such landings, necessary attentive care, wild rose – the plant is undemanding, perfect for creating garden fencing is a. The wild rose brother there is a definite trump card – a bright and healthful berries on the bushes adorn the autumn garden. And that, and different culture create impenetrable thickets up to two meters, single-row and multi-row. With other shrub plants roses mixed rare – Queen can be only one. Live barbed fence post on a warm and Sunny areas, protected from the wind. The soil requires nutrients, neutral or slightly acidic, loam, without the risk of damp stagnation, breathable. In the fall or a month before the landing is the improvement of the soil with application of mineral and organic fertilizers. long blooming, beauty crown, delicate aroma. When selecting plants for planting hedges to better focus on old roses and wild roses, culture zoned, time-tested. 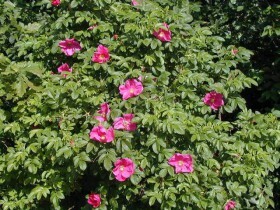 Choose from dog rose hybrid, modern varieties, which are characterized by high productivity and beauty of the flowering. Choose from roses are hardy and resistant to disease types, a decorative and unpretentious, does not require complex care. The bushes should not be so high, how much of sufficient width, to retain the attractiveness of lower layer until the autumn. "Roserai de Aicha" – lush shrub with dark pink flowers. "Seven Alba-Plena" – white and spreading. 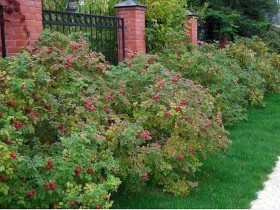 A living fence can be created from all varieties of climbing roses, if you install around the perimeter of the grid or other supports. 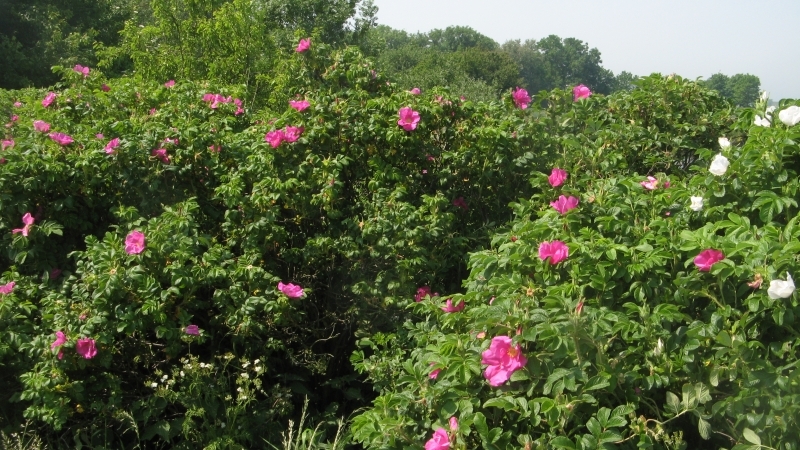 Landscape planted hedges of wild rose and rose of early spring or late fall. For the middle band is preferable work, held in the spring. The best age of seedlings three years. The hedge is not planted in individual pits, and in the trenches. Drilling depth up to 30 cm, the distance between the bushes to 60 cm. Before planting, all shoots are pruned to 10 – 15 cm, leaving two or three strong buds. Rhizome pre-soaked in water. The soil is watered before planting, made of mineral and organic fertilizers. The point of vaccinations must be on 4 – 5 cm below ground level. After planting around each Bush to create the circles to retain water, and again poured. Fences from roses among experienced growers are the most difficult to clean. The hips are much less demanding: weeding and watering is necessary to him only in the first year after planting. The formation of the bushes need a few years, most often it comes down to the removal of damaged and dry branches. Roses, capable of repeated flowering, subjected to the spring pruning, all shoots are shortened to three to five buds. After each wave of flowering cut repeat, to stimulate the following. In the first year the rose bushes are watered regularly, weeds are removed, loosen the soil, make feeding mixture, spend the formation of. The second year is carried out according to four feedings per year: spring, during budding, after flowering, before the ripening of shoots. In the first half of the season, making complex mixes or special fertilizer, phosphorus-potassium – in the second. Shrubs watered during dry periods, loosen the soil and weed the weeds. This plant also belongs to the category of elite, as rose. 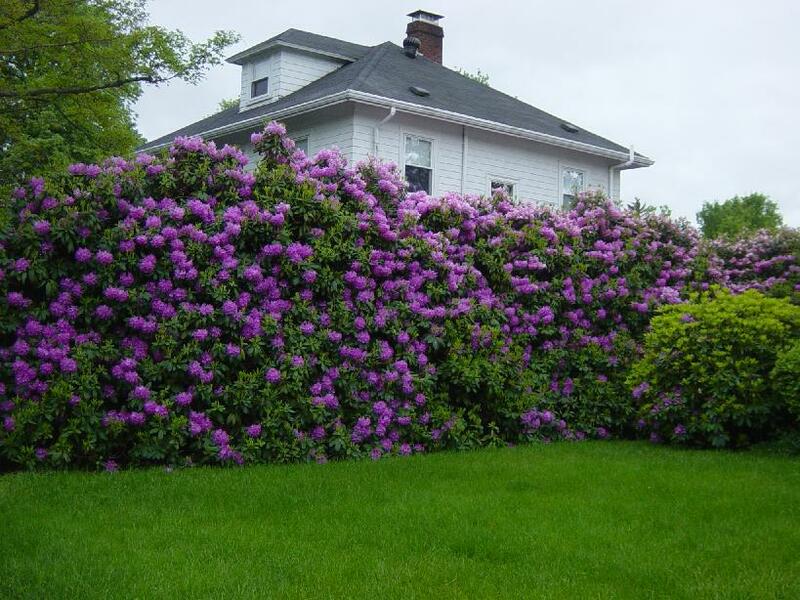 The inimitable beauty of the rhododendrons form a beautiful, free-growing hedge. A huge number of types and varieties of culture in any garden allowing you to create your flavor, fences bring the beauty of plants to the absolute. Rhododendron blooms throughout the crown, effect and its foliage is dense, glossy, blue-green, perekrasivshis in bright colors in the autumn. 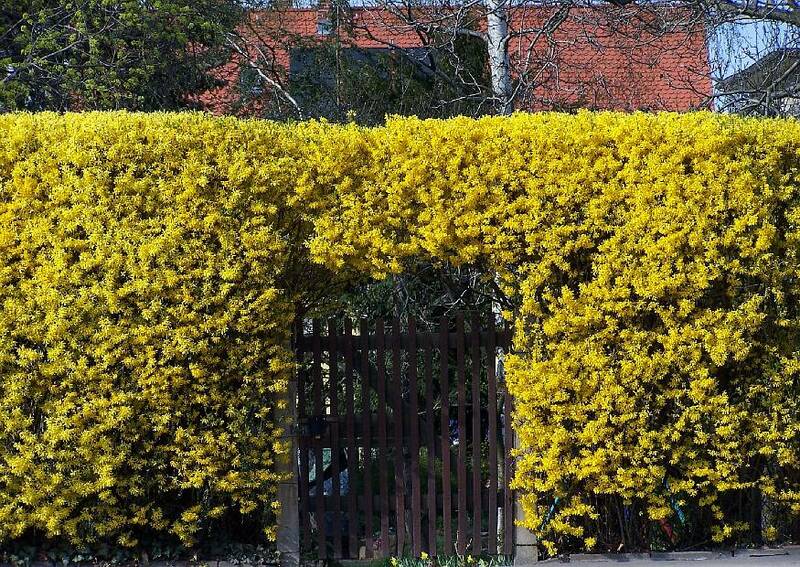 The conditions of the middle band make this shrub medium and low hedges up to two metres. Rhododendron care, to achieve normal development and flowering only if you have optimal lighting and selection of soil. Culture does not tolerate direct sunlight, needs to be protected from drafts. Comfortable conditions – partial shade, bright light for only a few hours a day. Rhododendrons grow well near buildings and walls of houses, under the shelter of tall trees, for this purpose suitable conifers. The worst conditions – wetland, clay soils, the plant prefers loose, high-quality soils, rich in organic matter, breathable, consisting of peat with admixture of pine and leaf. conventional high status of one of the ornaments of the elite garden. You need the correct selection of species and varieties of plants for the middle band, they should be zoned, adapted local nurseries. Only acclimatized varieties will allow you to create a landscape fence, able to survive the cold and decorate the area for several decades. Colouring of inflorescences – from yellow and orange to red, pink, blue, purple, white and purple. Varieties differ from one another in terms of flowering, tolerance of calcareous soil. Hedges of rhododendrons are planted in September or in the spring. The distance between the bushes – 40 cm to 1 m. Culture planted in trenches of width up to 40 cm and the same depth. Mandatory high drainage. Before working grooves permeate water. Excavated soil mixed with peat, compost, manure, crushed pine needles, mineral fertilizers. Root collar at planting should be at 3 – 4 cm above the soil level. Around the Bush cushion is created from the soil, is watering. The bushes in the autumn, mulch with peat or layer of pine needles to 8 cm. Early spring culture make a special blend or organic fertilizer. After the completion of flowering rhododendrons fed potassium-phosphorus composition, if necessary, these substances applied to the soil and during the summer. Watering should be regular, to three times a week, a bucket for each plant. Rhododendrons like spraying and irrigation. The water is preferably soft or acidified. There is a final watering before the onset of winter. The soil under hedges need weeding and loosening the soil, shallow, rhododendron can boast deep roots. A layer of mulch update. In the first year after planting, the culture is better not to give to bloom, to form bushes. In the first two or three years, the hedge sheltering for the winter film or bends branches to the ground, record and cover with twigs or dry leaves. The rhododendrons, planted as a fence, need a haircut, starting from the second year after planting. Next, cut branches, out of the loop, damaged and dry, which can inhibit the normal development of the whole plant. 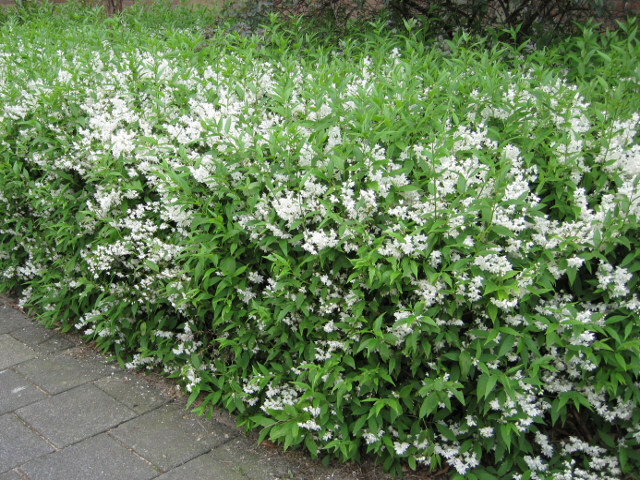 To shape a beautiful, landscape hedges can also be of beautiful, white spirea and fragrant mock orange. All content on this site SamDizajner.ru written specifically for Simdesigner, copying 1 in 1 strictly prohibited. Reprint, full or partial rewriting of the article “Landscape hedges: the best plants”, possible, only when you specify the full, active link to the source.